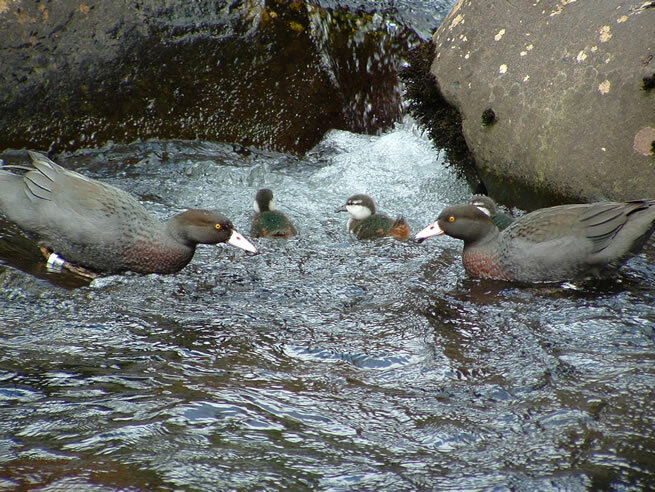 The blue duck is also known by its Maori name, Whio, and is endemic to New Zealand. It is a small grey-blue duck with chestnut chest feathers and is superbly camouflaged against the back-drop of raw river rocks. It is one of only three ducks world-wide that exclusively live on fast flowing rivers and is well adapted for this environment. Blue ducks are territorial with each pair living and defending a specific part of a river. Each pair generally nests once a year, with hens laying a maximum of 9 eggs, though more commonly 5 or 6. Most often only 2-3 ducklings reach fledging age. They can live for approximately 12 years, though average life expectancy is much shorter due to predation. Blue ducks live on clean and often fast flowing rivers and most birds now live within the mountains or back country of New Zealand. In these rivers they feed primarily on small freshwater invertebrates. Why is the blue duck threatened? Blue ducks were considerably more common and widespread prior to the introduction of mammalian pests like stoats, weasels, ferrets and rats. These highly efficient predators eat the eggs, ducklings and occasionally nesting females. The blue duck also requires clean rivers with abundant freshwater invertebrates, such as stonefly and caddisfly larvae. The degradation of many New Zealand rivers by silt and other pollutants, has resulted in many rivers being unsuitable as habitat, lacking quality food and places to nest. There are thought to be between 2000 and 3000 blue ducks remaining in the wild in New Zealand, with only 1200 occurring in the North Island. The central North Island’s rivers that arise from Tongariro National Park are one of the significant remaining strongholds for blue duck, with their clean snow fed water and forested catchments. Read more about the blue duck on the Department of Conservation website.